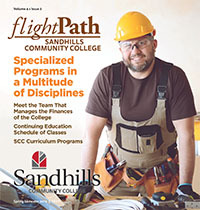 Sandhills Community College (SCC) is committed to making its electronic and information technologies accessible to ensure equal access for all users.‚ Both new and existing web content produced by the college will meet Web Content Accessibility Guidelines (WCAG) 2.0, level AA by June 30, 2021. Informing third-party developers of SCCs policy on web accessibility. Instituting a 5-year plan on web accessibility. Providing links to information and resources on web accessibility. This information will be reviewed regularly by the Integration Technology Committee. All new content that is published will be subject to current accessibility standards. If you need further assistance with accessibility for any of our online content, please contact accessibility@sandhills.edu. For questions and/or comments regarding this accessibility statement, contact accessibility@sandhills.edu.